This first shot was actually taken from the roof across the street while I was with the rooftop angels. This was opening night. The color temperature is correct, as that was lighting scheme that night. I normally shoot photos with the X-T2 using the Pro-Neg Standard film simulation, which mutes the colors. But since colors are important for this event, I shot with the Standard film simulation for both the X-T1 and the X-T2. The X-T1 had the 50-140mm f/2.8 lens mounted, while the X-T2, during performance nights, had the 16-55mm f/2.8 lens mounted. 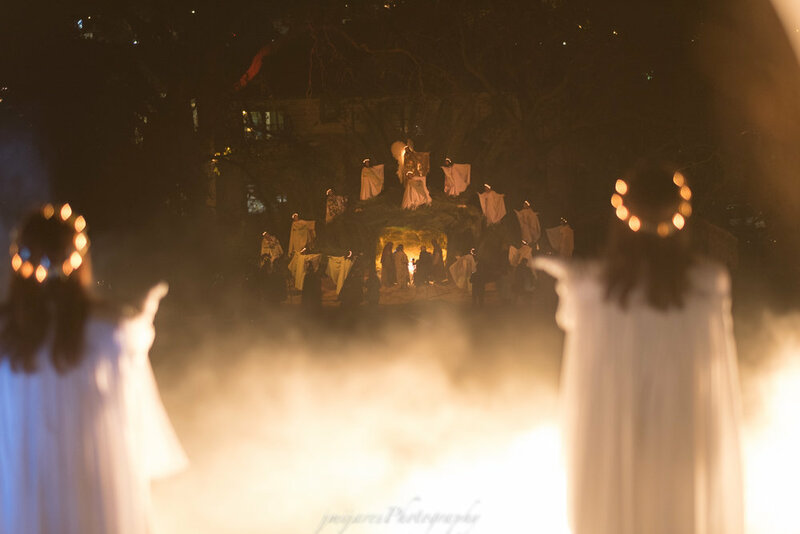 Some of the shots below are intermixed with the full dress rehearsal as that was the night I could get up close to the angels and give each one their own personal close-up. This next shot is what the perspective of the angels is like looking at their counterparts across the street. You can see that I'm really pushing the ISO this time around with the X-T2. 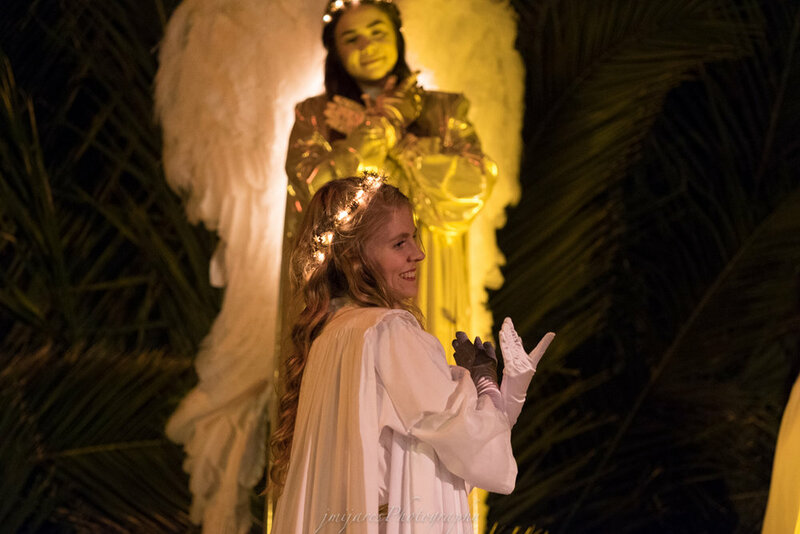 Next are a few close-ups of the angels, all shot during the dress rehearsal night using prime lenses. Again, you can see that I'm going a little crazy with the ISO, but the results are still pretty good! Of course, more important than the angels is the manger itself, and the Holy Family seated there. Each night, it's a real family and a real baby laying in the manger. It's admirable that these volunteer families will stay there for over three and a half hours, playing their roles with dedication and diligence. 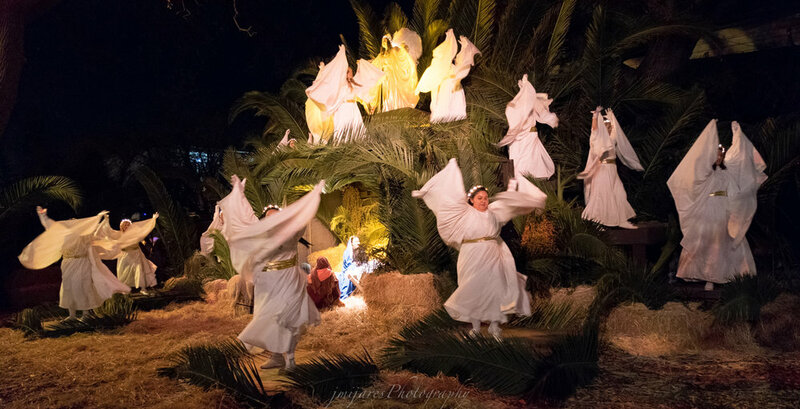 This next shot was one of the few moments where I was able to get all of the angels in motion. I had to shoot from the side because this was on closing night and there were huge crowds watching off to the left of the frame. Of course, I have to end this blog posting with my key photo for the 2017 event. This shot wasn't planned. But when I was on the roof, I saw and had to go for it. As you can see, I used the 56mm lens for this shot, which I think helped preserve the sharpness of the angels in the distance. 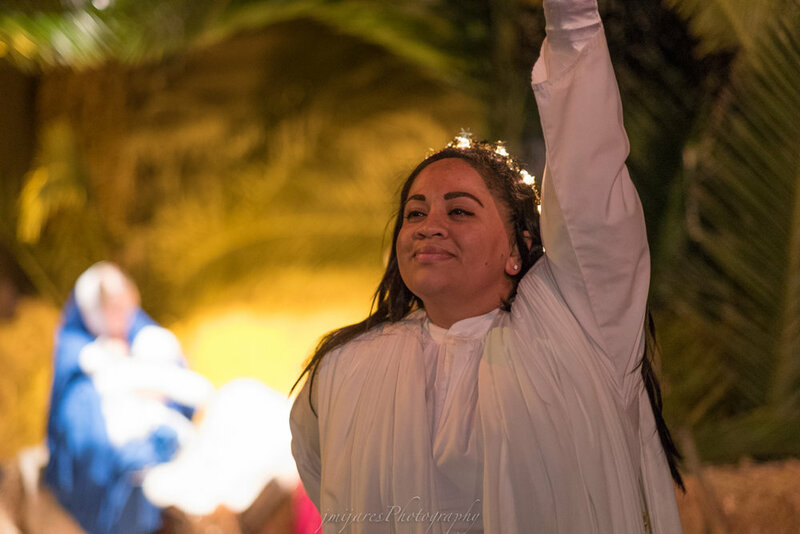 That may be it for Bethlehem AD 2017, but 2018 will be its 26th year! May it continue on and on!